The increasing amount of pomegranate products on the market makes me happy, but my favorite form of pomegranate is the fresh fruit. Sure, it’s a process to actually get to the seeds and if you’re not careful they’ll stain your fingers red, but those are minor once those sweet juicy bits of goodness are freed for consumption. I’ve always loved books. It’s a familial addiction. I was introduced to used book stores as a kid and to me it’s like a treasure hunt. You never know what new gem you’re going to discover. I also love that when cleaning out my bookshelf I have a place to send old friends where they might be appreciated by a new reader who has yet to explore their depths. Of course, it doesn’t hurt that it’s less expensive on a book addict’s pocket as well. Note: I do shop new books as well and am aware of how important it is for authors that new copies of their books be bought. In preparation for NaNoWriMo I made a few stops while I was in Lansing this past week including Wanderer’s Teahouse and Cafe, a new teahouse across from Michigan State’s campus. All of their tea is handmixed loose leaf in a variety of types and flavors. I had the mango marigold ceylon when I stopped by and it was warmth to a tea lover’s soul. I can’t wait to be able to make a write-in there and try another of their blends. As anyone who has been to my apartment can attest I have a bright red adjustable dress form in the middle of my main living area just about halfway between the couch and the kitchen. After years of contemplating one, I gave in last Christmas and I am so glad that I did. Not only does it make it far easier to construct my personal sewing projects, but alterations that I’ve avoided are as simple as they should be. If you sew, especially for yourself, it’s totally worth the investment. Have I mentioned recently that I’m a geek? This is another one of those wipe away any doubts moments. A shenanigan ago, when the zombie invasion took place, an ax and a butcher knife, er, appeared in our work area which quickly became absorbed into our office culture. The ax I had picked up last year for a rainy day (you never know when you might need a plastic ax). 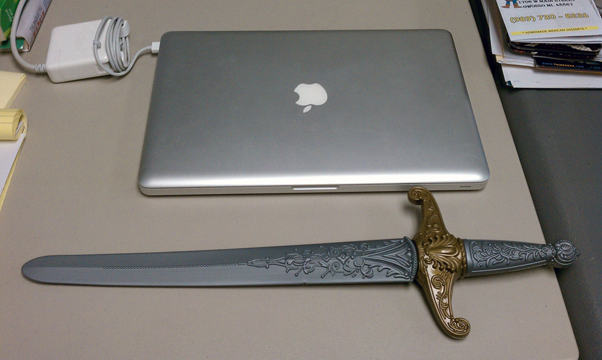 Well, those weapons disappeared recently (rumor says into our VP of Tech’s office) and, geek girl that I am, I couldn’t help but pick up this awesome dollar store sword whilst shopping for our most recent shenanigan. It’s really too bad that I left my equally high quality knight’s shield behind when I switched jobs.